Long distance trekkers will surely welcome their dream to come true with the inauguration of the new Pécs Forest Circle Trail created by Biokom Nkft. The Pécs Forest Circle Trail has been finalized and with professional assistance of the Duna-Dráva National Park Directorate the Pro Silva e-learning path of Kismély-valley has also been established. Few residents of Pécs are aware that in 1747, upon the orders of Maria Theresa, a royal committee directed the issue of the possession of forest areas between the bishopric and the city. As a result of the agreement reached, the boundaries of the forests of Pécs stretched as far as the Melegmány valley. This state was sustained until 1946, when, despite protests of the city, the forests were nationalized and the areas north of the Misina-Tubes ridge became the possession of the so-called State Forests. The new hiking trail created by Biokom Nkft. will hopefully inspire visitors to tour some parts of the historic Pécs Forests. The hiking trails starting from Mandulás and Remete-meadow are of various lengths, they are easy to walk, without steep hills along the way, therefore small children and senior people can also cover them. Trails ranging from 7.2 km to 20 km of length can be selected and trekkers can modify routes depending on the conditions, as trails are interchangeable. 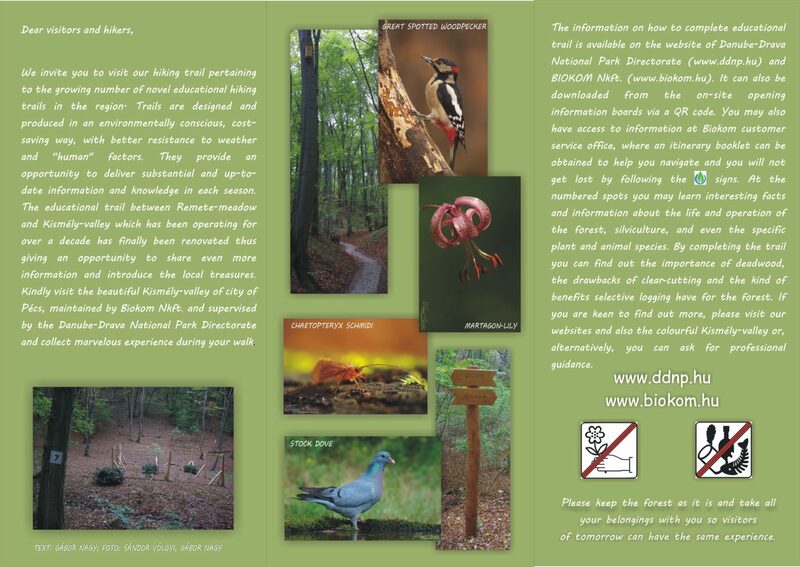 Orientation is promoted by the map of this publication and signs and information boards are displayed along the routes by BIOKOM. The map of the tourist trail can be downloaded from the website of BIOKOM Nkft. ( maps), furthermore, it can also be downloaded from the on-site information boards via a QR code. Equipped with these sources, we can navigate along the way towards our planned destination and learn about the sights of the area. The viewpoints offering magnificent views have recently installed new benches. 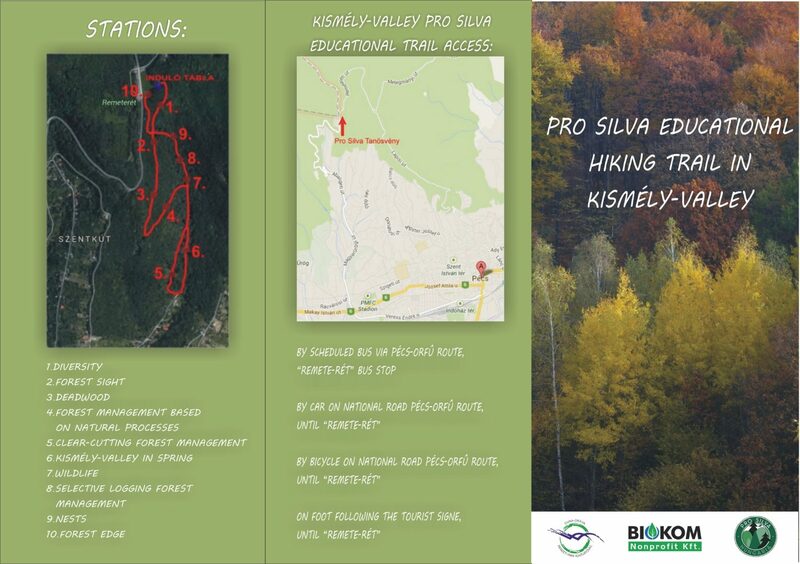 The Pro Silva Educational Trail of Kismély-valley can also be integrated into the big Forest Circle Trail. During the walk we can meet the natural treasures of the Western Mecsek Protected Area. In springtime we can enjoy a variety of orchids (e.g. monkey orchid, woodcock bee-orchid), and the lovely scent of the burning bush herbs, and we may also get the chance to see pécsi leopard’s bane, which is a hybrid species exclusively specific to the Mecsek area. In winter, in the close vicinity of the bird feeders installed by BIOKOM Nkht. we can encounter a variety of titmouse, nuthatch and robins, and if we walk quietly, you might be able to observe foxes hunting for mice in the forest. The Pro Silva Educational Trail of Kismély-valley, established by Biokom Nkft. and the Danube-Drava National Park Directorate, can be covered on a single hike or, alternatively, it can also be covered from Remete-meadow stitching our hike together with Pécs Forest Circle Trail. Recently, the installation of educational hiking trails have been considered as novelty, as they are designed and produced in an environmentally conscious, cost-saving way, with better resistance to weather and “human” factors. Today, the so-called ‘educational trails’ have gained popularity, which, in addition to the advantages mentioned, provides an opportunity to deliver up-to-date information and share knowledge in each season. Our educational trail between Remete-meadow and Kismély-valley has been operating for over a decade, and it has finally been renovated after it had become the subject of vandalism in the last few years. A guidebook for the Pro Silva Educational Trail helping trekkers complete the walk can be downloaded from the two organizations’ websites (www.biokom.hu, www.ddnp.hu) or accessed via a QR code on the onsite information board in Remete-valley. The Pro Silva Educational Trail comprises 10 spots, through which we present visitors the natural fauna, the life of animals in the forest and examples for forest management similar to natural processes. Our educational program provides useful information and knowledge for tourists, transforming their knowledge about forests, furthermore it offers interesting and considerable experience for professionals, too. The Pro Silva Educational Trail is 2,5 km long. 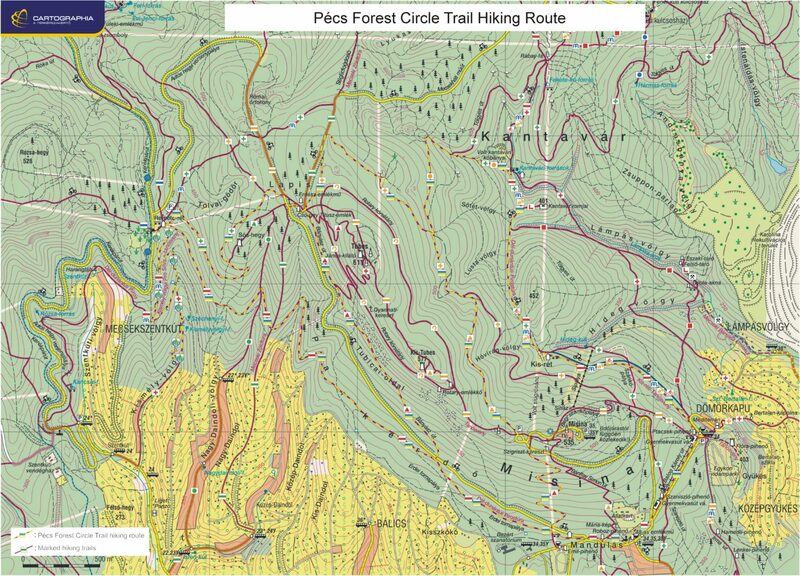 Visitors who are keen for challenges can choose to complete the Pro Silva Educational Trail combined with Pécs Forest Circle Trail which makes a 20km trek in length. We look forward to meeting even more nature lovers and hikers on the paths of the “Pécs Forest Circle Trail” and the Pro Silva Educational Trail. Enjoy the time and have a great hiking experience in our forest.